Find hotel near Toy Kuay Teow Reua Boat N ..
Bangkok is a huge city and the culinary scenes here is very vibrant. There are many places here to enjoy the famous kuay teow reua (boat noodles) and one such place is Doy Kuay Teow Reua (Noodle). The broth here is dark, thick, and rich giving the dish its superb taste. The spices are well-blended with the noodles giving it its rich flavour. If you are a noodles fan, this place will surely ignite your taste buds. The ambience of the place is quite relaxing, adding to your experience. Toy Kuay Teow Reua Boat Noodles is not a popular tourist spot and visitors exploring prime attractions like Wat Pho Reclining Buddha, B T S Skytrain, Rajawongse Clothier, Grand Palace and Wat Phra Kaew. For more popular attractions visit things to do in Bangkok. Toy Kuay Teow Reua Boat Noodles is generally not available on the guided Bangkok tours, but there are plenty others that are worth visiting. Create a customized plan for your visit using the Bangkok trip planner. You can use ready templates or start from scratch for the same. You can enjoy a comfortable stay in the city by booking the best hotels in Bangkok like Pas Cher Hotel De Bangkok, Ibis Bangkok Riverside, Kokotel Bangkok Surawong and Marvin Suites. Draft the best Bangkok vacation packages using ideal templates offered by TripHobo. Also explore how to reach Bangkok on the go! Love this? Explore the entire list of places to visit in Bangkok before you plan your trip. Fancy a good night's sleep after a tiring day? Check out where to stay in Bangkok and book an accommodation of your choice. How popular is Toy Kuay Teow Reua Boat Noodles? People normally club together The Platinum Fashion Mall and Vivente Life & Coffee while planning their visit to Toy Kuay Teow Reua Boat Noodles. Amazing food, super cheap. Each bowl was 15 baht. Service was good. There were additional condiments you could pay for at the table, which is a "trap" but they're so cheap it doesn't really matter. The sugar cane drink was nice, cold and refreshing and contrasted nicely with the sweet, salty and sour boat noodles. Would definitely recommend if you're in Bangkok. Didn't get food poisoning. Our taxi fare was more expensive than what we ate. It's crazy good! Just the right amount of spice and it has a herb flavor to it. We went in the morning so it wasn't as crazy during the lunchtime crowd. Staff couldn't speak English very well but were nice enough to have sign language with. Highly recommended if you do a side trip to this place. Cheap and delicious. Just the way I like it. Spectacular. Little small bowls of noodles come up quick. Beef and pork are the mainstays with numerous choices for noodle types. Thai boat noodles are one of my faves and they do it right. 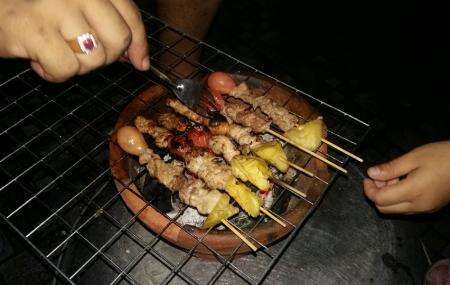 There are also skewers from another vendor but they serve you right at the table. The peanut sauce that comes with us great. Also super cheap. Don’t remember what we paid but it was minimal and we were stuffed. Delicious boat noodles. You'll be asked what meat (beef/chicken/pork) and what type of noodle. It'll appear almost instantly along with crispy chips and bean sprouts. The broth is intense and flavourful. The place itself is super local - don't expect clean table tops and nice floors. Tasty soup, friendly staff. A short walk from victory monument. You'll be able to choose your meat and kind of noodle. Getting there at first I didn't trust Google maps: it was a short walk (2 or 3 blocks) from victory monument on a side walk along a canal, and then a left and we were there.